Honestly, I'm still working on building a PBW 2016 Playbook to which I'll attempt to adhere from June 3 - June 12. While I do, however, I'll be delivering to you some goodies, call them blasts from the past. I've got boxes - both literal stacked boxes as well as electronic boxes - full of documents and images from the last 25 years or so of beer around Philly and the mid-Atlantic region. Each day leading up to the Hammer of Glory Relay and Opening Tap on June 3, I'll share something with you. Could be from a previous PBW or just some random nugget from the past related to beer in and around the city. Today, I'll begin with what I just unearthed yesterday - a Bastille Day Menu from Cuvee Notredame. Food, beer, bubbles, dogs, al fresco, sabering at the corner of 17th & Green Streets was an annual occurrence. 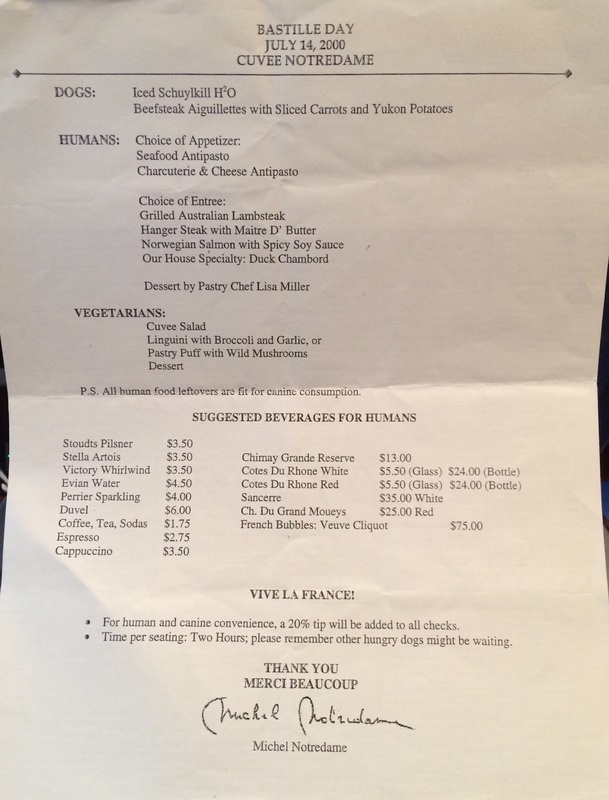 The year this menu is from, 2000, I recall Michel Notredame telling me he believed he did nearly 250 canine covers that night! St. Stephen's Green now sits at this Spring Garden neighborhood corner, and Notredame had left the country in 2003 and passed away in 2011. For a time, however, it was one of the city's destinations for good food and beverage and a good time.